The MinoHD uses the same fixed 1.5mm, f/2.4 lens found on all the current Flip Video models, which allows the camera to perform rather well in various lighting conditions, including situations where lighting is not always the best (like your living room or a dimly lit restaurant). This is an internal lens that is protected by a glass cover. There is no optical zoom factor, however you can opt to use a 2x digital zoom function. On the back you will find only a few simple controls, along with the Mino's 2.0-inch LCD screen. This is screen is used to frame and review you videos as well as navigate the brief setup menu. Resolution is 320x240 (approx. 76,800 dots), which is rather low for a LCD in this day and age. The entire back of the camera is covered with a shiny coating that is extremely reflective, which could make it difficult to see in bright conditions. Flip included no brightness adjustment option what so ever. Here you can see a close-up of the controls on the back. Only the REC button in the center of the frame is an actual button, as all other controls consist of touch-sensitive areas built into the surface. These spots operate easily but are also very easy to touch and change accidentally. Once learned, the controls are easy to use. 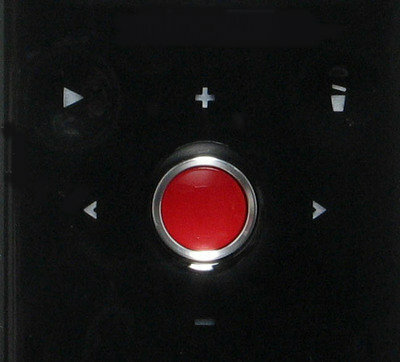 The + and - control the digital zoom, while the left and right arrows navigate through your recorded videos. You can also see the Play and Delete controls at the top left and right. In order to connect the Mino to your PC or Mac for charging the internal Li-ion battery pack, accessing the included FlipShare Software or transferring images to you computer, you need to extend the USB arm connector. This unit is hidden in the top of the camera, and is flipped out by pressing a small toggle switch on the upper right hand side of the camera. The internal Li-ion battery is rated for up to 1.5 hours of continuous record time, and takes about 3 hours to full charge via a standard powered USB port; which isn't half bad. On the bottom you will see the Mino's only other output port, which is used for connecting the camera to your HDTV or PC using a mini HDMI cable. On you right you can also see the tripod mount.